We all love having festive green foods on St. Patrick’s Day. Celebrate a bit more naturally this year with these 36 naturally green foods for St. Patrick’s Day. To me, one of the most fun things to do for St. Patrick’s Day is to think of a variety of fun green foods for the holiday. I guess I can thank the foodie in me for that. There are a variety of green-themed foods out there that you can purchase pre-made or make yourself like candies, cupcakes, and even green eggs and ham. I don’t know about you but for some reason, I tend to get boxed in on thinking of foods that need food coloring to become green. This year I’ve resolved myself to eating a more natural diet. So, while I will still indulge in some homemade green velvet cupcakes, I also wanted to think of some naturally green foods for St. Patrick’s Day. I really thought I would struggle to come up with a sizeable list. Honestly, once I started thinking about it, I realized there are a ton of naturally green foods for St. Patrick’s Day I could be serving. Most of these green foods just happen to be super healthy and full of awesome vitamins, minerals all that healthy stuff we’re supposed to have more of, too. How awesome is that? I know I’ll have no problem chowing down on some yummy green cabbage, grapes, and broccoli for St. Patrick’s Day! Cucumbers – Check out these 30+ recipes using cucumbers. Green Apples – Love making these fried apples with green granny smith apples. Celery – Lots of green veggies go great with this cheesy bacon ranch dip, like celery. Spinach – I love using spinach in these mini frittatas. Cabbage – I love using lots of cabbage in these Irish-Style mashed potatoes that are also great for St. Patrick’s Day. Asparagus – See our 5 tips for buying fresh asparagus and our easy roasted lemon asparagus recipe. Brussels Sprouts – These cherry bacon brussels sprouts are so good. Green Beans – My favorite recipe for green beans. Parsley, dill, basil, and many other herbs – There’s a lot of fresh green herbs in this beautiful cucumber salad. 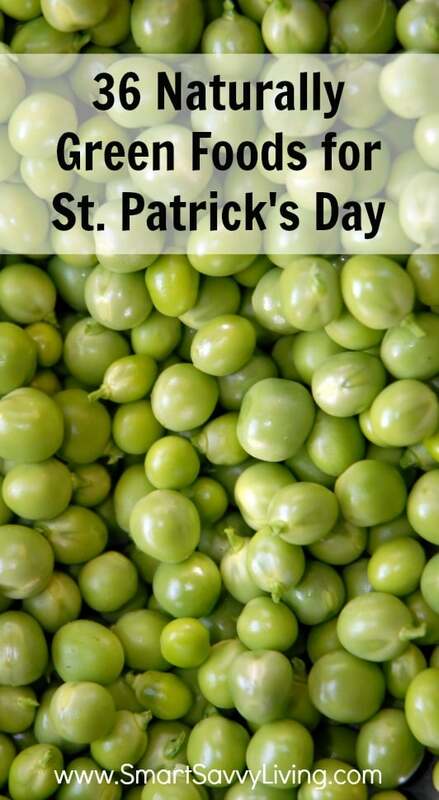 Can you think of any more naturally green foods for St Patrick’s Day? What is your favorite? I love green foods they make me so healthy. This is brilliant- I might even be able to get my five year old to eat healthy stuff if I tell him it’s for St. Patrick’s Day! Holy cow! you came up with a much bigger list then I would have! Those are some great ideas. I love edamame as a snack with a little salt! I absolutely LOVE vegetables – so this is like the ultimate green snack list for me lol Edamame is my favorite. Even my 5 year old will eat the entire bowl when I steam and salt them. Delicious ideas! My favorite green food is green beans … or peas! This is such a great list! I love how extensive and comprehensive it is. That’s a pretty impressive list. I would not have been able to list that many. I can’t think of any more. My favorite would probably be okra – especially if it is breaded and fried! Thanks for this list – it gives me tons of fun green foods to work with in the weeks leading up to St. Patrick’s Day and is a reminder of some great new foods to introduce to my kiddos this time of year!